The Russian leader recalled that the two countries "have a deep-rooted relationship, and our people’s spiritual kinship is obvious"
BELGRADE, January 17. /TASS/. 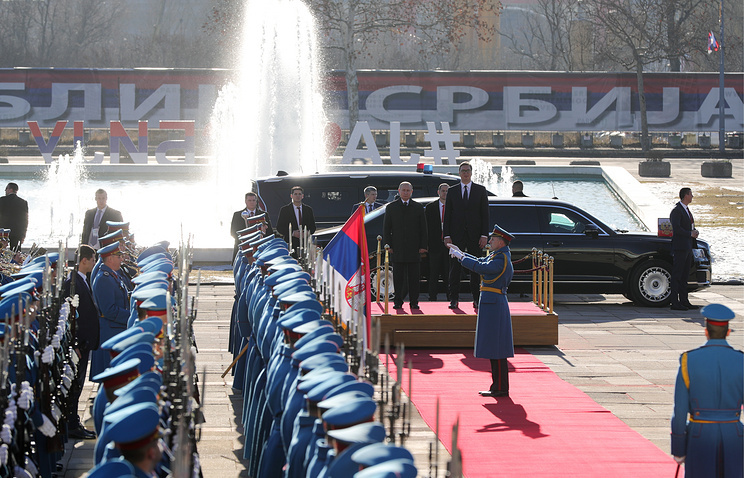 Russian President Vladimir Putin has thanked residents of Belgrade for their warm welcome in the Serbian capital. "I want to thank residents of Belgrade and the entire fraternal Serbian people for such a warm welcome. This can be seen on people’s faces in the streets," he said at a meeting with Serbian President Aleksandar Vucic. "We have a deep-rooted relationship, and our people’s spiritual kinship is obvious," Putin stressed. "All that helps us build relations today." On Thursday, people in the Serbian capital greeted the Russian leader who had visited the Belgrade Liberators Park with applause. Putin and Vucic who arrived in the memorial cemetery in the Russian leader’s Aurus car were met by Belgrade Mayor Zoran Radojicic and several hundred citizens. The Russian and Serbian national anthems were played, while people applauded vigorously and chanted greetings to the leaders. Putin’s visit sparked huge interest in Serbia and is viewed as a historic event. More than 700 reporters from 160 media outlets from all over the world were accredited to cover the event. Belgrade is adorned with Russia’s flags, with many people hanging the tricolors or the Russian president’s portraits on their balconies.